I adapted this pirate ship project for two age-groups. The younger class ranges from almost-three to just-turned-four, and the older class comprises four to six year olds, plus one eight year old. Both groups completed their artworks in two 45 minute sessions, but for the younger children I simplified the project and reduced the number of steps required to bring it all together at the end. However the key skills and processes were the same for both groups – creating painted paper with different textures, cutting with scissors, composing a scene, glueing and sticking. 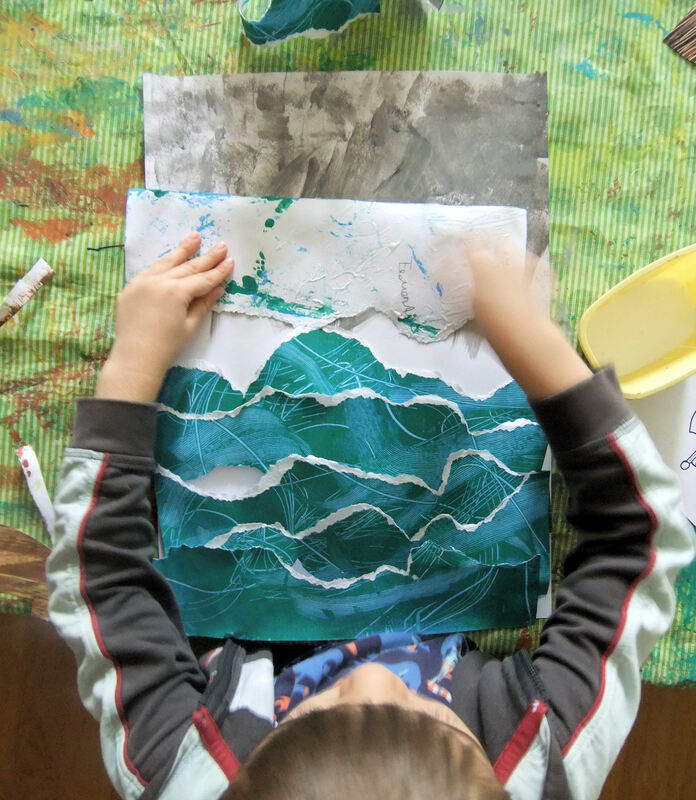 Both groups spent the first session producing painted papers to represent the textures of water and wood, to be transformed into ocean and ship the following week. The children used large household paintbrushes to coat an A3 sheet of paper with light blue school tempera paint. 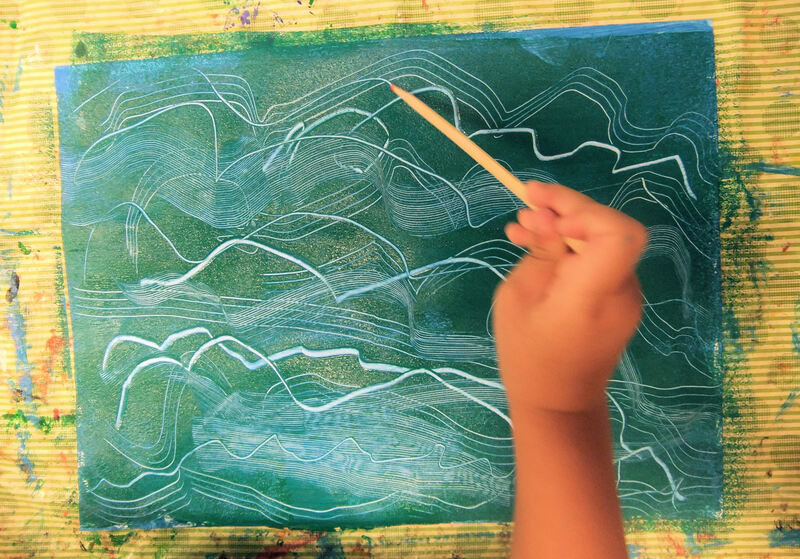 Then they used small paint-rollers to add a layer of blue-green paint, before going to work making wavy and squiggly lines with a range of “texture tools”. We used everyday items such as combs, plastic knives and forks, chopsticks and lollipop sticks rather than expensive purpose-made texture tools, which can be a bit large and unwieldy for small hands, as well as producing somewhat homogenous results. I think it’s always more fun to use recycled household junk for children’s arts and crafts as it teaches them that they can be creative with whatever comes to hand… and we discovered that the serrated edge of a plastic fork creates a really cool texture of very fine lines. 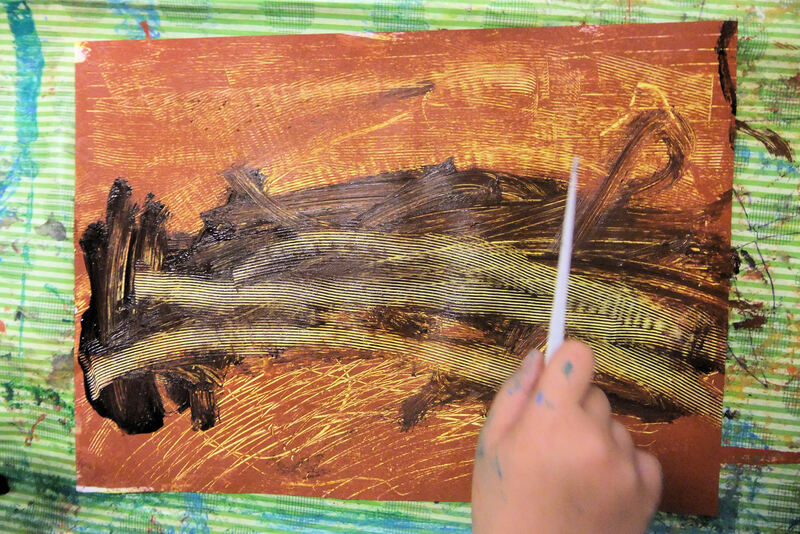 Next the children used a base of yellow paint with brown rolled over the top, to create a wood-grain effect, adding depth with some black streaks. The older group took another sheet of white A3 and filled the top third with storm-clouds, combining white and black paint and sponging it on in streaks and dabs. With all the painted papers prepared the previous week, the second session was all about cutting-out, gluing and assembling. The first task was to cut-out a pirate ship shape from the wood-effect paper (I let them draw around a template due to time constraints, but the older children could have drawn their own). The children also cut three strips for the ships masts, and some created a crow’s nest too. 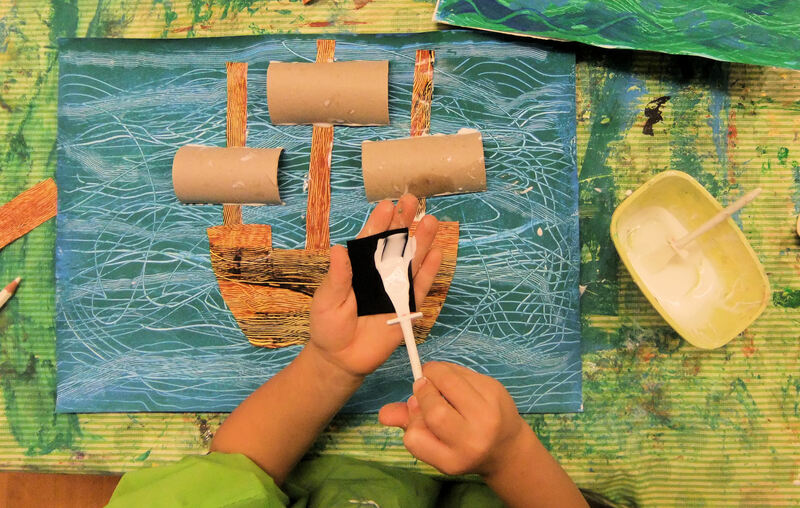 The younger group then went ahead and glued their ships onto their textured ocean backgrounds. 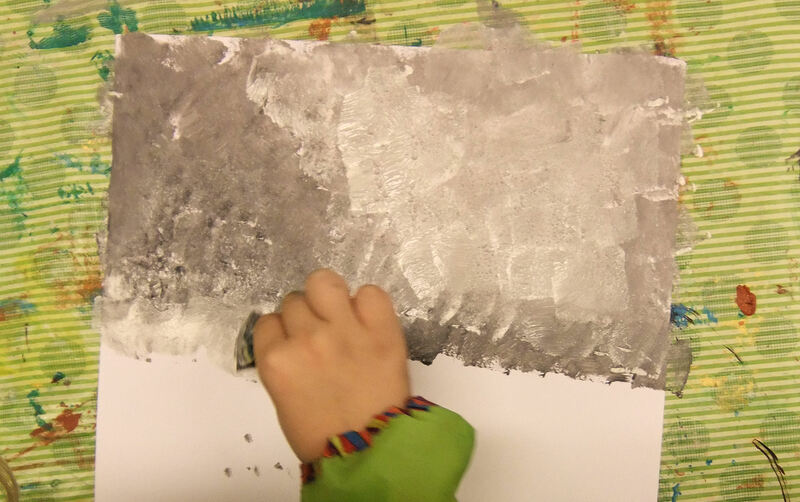 The older children created even more texture in their seas by tearing their textured paper into horizontal strips with wavy, jagged edges. I had underestimated how challenging this would be for such small hands, and all but the oldest children needed a helping hand to avoid a tabletop filled with paper scraps! The torn strips were then arranged in layers beneath the stormy sky background and glued down one by one look like huge ocean waves. The ship was tucked behind one of the waves and stuck down with three tall masts. Sails were created from toilet roll tubes that had been cut in half. Each child drew a Jolly Roger to fly from the top of their ship, and portholes and windows were drawn on with coloured pens as a finishing touch. The children were incredibly proud of their turbulent pirate scenes, and I couldn’t have been happier with the way they worked out. I love the combination of the textured paint and torn edges which give the effect of breaking waves and create a real sense of movement and energy, set off by the dramatic, thunderous skies. Adapted from ideas seen on Artsonia and Deep Space Sparkle. Wow! I love the white water crest implied by the tearing of the water-painted paper! I hope to be able to do this in my own classroom, thank you!